Leemis, Ralph B. - Groelle & Salmon P.A. Ralph B. Leemis is a Florida native from Jacksonville, Florida. He considers himself a “second generation insurance defense lawyer” following in the footsteps of his father, Lloyd C. Leemis, a former FBI Special Agent under J. Edgar Hoover and a founding member of Boyd, Jenerette & Leemis, now Boyd & Jenerette, P.A. He grew up with the mindset of an insurance defense lawyer, attending depositions and trials as a child, and participating in his first surveillance of a fraudulent worker’s compensation claimant at the age of 8. He graduated from Samuel W. Wolfson High School in Jacksonville, Florida in 1972 as his graduating class valedictorian. Ralph attended undergraduate studies at Furman University (for two years) and at the University of Florida, graduating with a B.S. in psychology from the University of Florida in 1976. Before attending law school, he worked as a Mental Health technician at St. Vincent’s Hospital, in Jacksonville, Florida. He then attended the University of Florida law school, graduating in 1979. While attending law school, he was one of a small group of founding law students for the University of Florida’s Student Legal Services (under Leonard J. Grill, Esquire), with the founding student group becoming notable lawyers and jurists throughout the State including Circuit Judge David A. Giant (deceased) and Fifth District Court of Appeal Judge Jay P. Cohen. After graduating from law school, Ralph began his litigation career at Peacock and Johnson, P.A. in Orlando, where his first case was a residential sinkhole loss in Seminole County, Florida. His second case was assisting in the defense of a property owner in the eminent domain proceedings for the Epcot interchange on Interstate 4. From 1980 until 1988, Ralph handled a wide variety of matters in general practice and litigation, and including selected bodily injury and property damage cases. 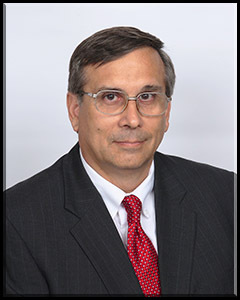 Since 1988, Ralph has focused his practice primarily on insurance defense law handling first-party and third party cases, for bodily injury and property damage claims and litigation. That has included defense of insureds and coverage matters (for insurers), including analysis and defense of fraudulent cases and bad faith claims. His training has included acquiring Supreme Court of Florida Mediation Certifications for County, Circuit and Appellate Mediations. His experience includes handling cases involving a wide variety of property damage matters, including sinkhole claims, roofing claims, windstorm losses, structure collapse, construction defects, water loss claims, theft, vandalism, and fire losses. He has been a frequent lecturer to the insurance industry (providing in-house training to clients and at annual insurance industry conventions) on subjects including examinations under oath and deposition techniques.